Special report analysis, galleries, figures, maps, diagrams, reports, sampling results, public presentations and more supplementing the April 6, 2017 news feature article “Brandeis-Bardin’s Toxic Denial”. An ongoing exposé this comprehensive relies on a lot of resources which you will find here. August 14, 2017 “2017 DTSC Brandeis-Bardin ‘White Paper’ Analysis” – Department of Toxic Substances Control’s error-laden and deception-heavy report on the state of Brandeis-Bardin’s contamination problems are deciphered and debunked line by line. August 14, 2017 “1991-2017 Brandeis-Bardin Reports Analysis” – American Jewish University released report and summaries show, among other things, that Brandeis-Bardin has known of tritium contamination from the Santa Susana Field Laboratory has been seeping into its groundwater since 1995. FIGURES – Includes maps, diagrams and tables. Easy way to see the breadth and scope of the contamination at and around the Santa Susana Field Laboratory. PHOTOGRAPHS – Historic images, white cattle, Brandeis-Bardin wells with toxin detections, public testimony at 2017 DOE DEIS meetings and more. 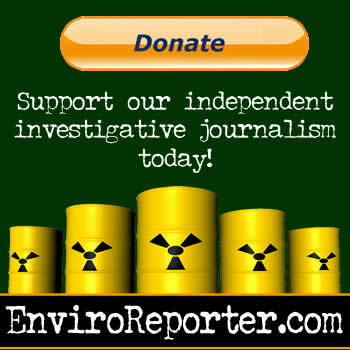 REPORTS/PRESENTATIONS/ETC – EnviroReporter.com sampling results for Brandeis-Bardin well and government-published reports and public meeting presentations. VIDEOS – A March 8, 2017 SSFL Work Group meeting video presentation “Pediatric Cancers Near the Santa Susana Field Laboratory” illuminates this shocking situation. Two videos document the impassioned public testimony at Department of Energy SSFL Draft Environmental Impact Statements meetings in Simi Valley and Van Nuys, California, in February 2017. “Sludge from Rocketdyne” from 2014 shows the goo in question and leaves little doubt that it is gurgling away at Brandeis-Bardin. Camp Alonim snippets show camp musicians cavorting near the white cattle reported on in the exposé, uploaded August 8, 2012. 2015 Update Brandeis-Bardin Institute Strontium-90 readings – EnviroReporter.com analyzes 1993 and 1995 Rocketdyne reports showing Sr-90 over background in 19 separate soil samples on Brandeis-Bardin. 2016 DOE-AJU Summary Brandeis-Bardin Soils – EnviroReporter.com compares DOE soil sampling results in Brandeis-Bardin with EPA-established “Background Threshold Values” (BTVs) in SSFL’s Area IV. DOE, and NASA, have agreed to clean chemicals and radionuclides to BTVs.